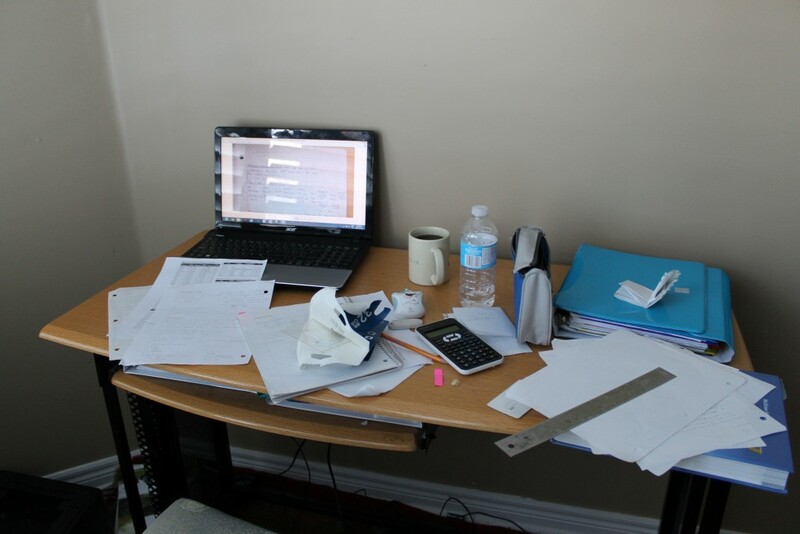 I find it hard to keep my desk organized during midterm season! Comment below if you have any tips. Welcome to the first midterm season of 2017. Chances are, within the next few weeks, you will write at least 1 midterm. If your schedule is anything like mine, you might even be writing 4 midterms… within the same week. It’s essential that you and I prepare for these midterms to the best of our abilities! In a previous post, I talked about my experience with meeting a learning strategist and how he taught me the techniques to study for a midterm in the weeks leading up to the exam. But what about the night prior to the test? If you have a midterm exam tomorrow, what should you be doing today to be at your peak performance while taking the test? During the day, make sure to briefly review all the concepts you need to know for the exam. Write down key points or formulas on a review sheet so you can glance at it periodically to help you with last minute memorization. Confirm the time and location for the exam. – Which building will you be writing the midterm in? Which room? – How long will it take you to get to the exam location? – What time will you need to leave your house or your class to get to the midterm location on time? Once you have figured out when to wake up and when to leave your house/class, set the appropriate alarms. Double check your alarms to see if they are for the right time, and make sure that your alarm clock or phone has sufficient battery and is not in silent mode. I have a tendency to sleep through my alarms sometimes, so even if I set alarms, I prefer to tell my mom or roommate to check up on me at a certain time for extra measure. Make sure to pack all the supplies you need for the exam the night before so that you don’t accidentally forget something important. Supplies include: writing utensils (pens, pencils), extra lead, erasers, white-out, calculators (if permitted), rulers, student I.D., or anything else you need. Some courses allow textbooks, summary sheets, or lecture notes, so pack those too if applicable. Finally, take a watch with you to keep track of time. Once you have reviewed and packed your bag the night before, stop studying, and set aside an hour to relax. You can relax by reading, meditating, watching a show, taking a hot bath, listening to music, etc. Relaxation is extremely important because your brain retains more information when it is relaxed – this will help you remember what you reviewed all day. Allocate enough time to get 8-9 hours of sleep the night before your exam. Sleep is extremely important to help you function while writing the test. Remember to not consume any caffeine at least 6 hours before your bedtime. Even if you cannot fall asleep, turn off all electronic devices or keep them well out of your reach (reminder: if your phone is your alarm, then don’t it turn off; just move it away from your bed). Turn off the lights and get in a comfortable position and try to get rest. Listening to music, drinking a warm glass of milk, or meditating are good ways to help you fall asleep. Make sure that you eat a light meal before your exam. Eat nutritious, energizing, and protein-rich foods. Avoid greasy foods because it may result in abdominal discomfort. Avoid foods high in sugar because you may experience a sugar high, followed by a crash, in the middle of your test. Refrain from drinking too much liquid, or else you may have to urinate frequently during the exam! Finally, don’t eat too much food, or else you may feel bloated/uncomfortable/drowsy. Those are the main pre-test pointers to help you perform at your best. Happy studying! Previous Post A Kangaroo at Woodsworth?